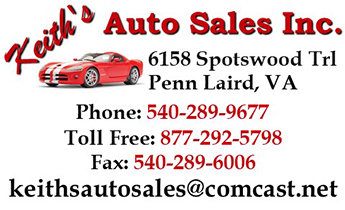 Keith's Auto Sales prides itself on offering the best quality used cars, trucks, SUVs, vans, and motorcycles in Penn Laird AND Harrisonburg, VA. Welcome to Keith's Auto Sales' website. We are a family owned and operated business and have been serving our customers for over 30 years! We also offer extended warranties on many of the cars we sell plus several finance options, including both bank and BUY HERE PAY HERE. Get top dollar for your trade, whether or not you still owe on it. We service what we sell! A complete vehicle history report is available from CARFAX for every car we sell. 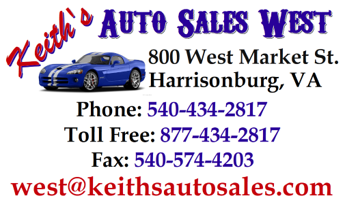 Be sure to visit our FaceBook page at https://www.facebook.com/keithsautosales/. Give us a call today to speak to one of our friendly, knowledgeable staff, we'll be happy to help with any questions you may have. Just Ask Your Neighbor! These New Arrivals Are Ready To Go Home With You TODAY!